This "West Village Corrugated Can" will cost you $99.95. For $99.95, you, too, can introduce a bit of New York City trash history into your home. Upscale clothing retailer Anthropologie is advertising a "handmade" tin can that comes with either rope or wooden handles, for sale online, as a "West Village Corrugated Can." 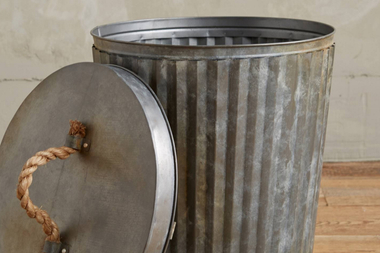 Initially priced at $148, the rusty trash receptacle is now a mere $99.95. "O the humanity / how did we come to this?" asked one reviewer, rhetorically. We turned to an expert on the history of New York City’s trash, former planning policy director for the city sanitation department Benjamin Miller, to find out. The bin pictured on Anthopologie's website is a design homage to the metal barrels that the entire city, not just the West Village, once used to collect refuse, Miller explained. Back in the days when everything was heated with wood and coal, they were called "ash cans," after the largest bulk of their contents. Anthropologie's product — "a beautiful example of aged corrugated metal," in one satisfied customer's words — looks like the "ash can" 2.0, which introduced corrugation as a refinement on the first model. The update made them no more popular, "for reasons you might imagine," Miller wrote in an email to DNAinfo. They were noisy when banged against waste carts and trucks, and they were heavy, leaving trash collectors susceptible to back injuries. They required storage and cleaning (to keep your own ash can in mint vintage condition, Anthropologie suggests wiping it with a dry cloth), and they were often stolen. Then came the great garbage strike of 1968. Dissatisfied with a contract offer from the city, satiation workers let trash pile up in the streets for nine days. Hardware stores everywhere were sold out of cans. "Dow Chemical came to the rescue with a new product they’d recently invented with a new resin," Miller explained. The idea of purchasing a bag just to dispose of it was a completely novel one, so Dow decided to give them away free during New York City's time of need. At the time, the city's health department required metal cans as a means of controlling the rat population. But it soon revised its rules, and the reign of the Glad Bag, propelled by TV advertising, began. Fifty years later, the cycle of history has completed a full turn, and Anthropologie is there to make a killing off our nostalgia for the days of yore.